Knaresborough (/ˈnɛərzbərə/ NAIRZ-bər-ə) is a market and spa town and civil parish in the Borough of Harrogate, North Yorkshire, England, on the River Nidd 4 miles (6.4 km) east of Harrogate. Knaresborough is mentioned in the Domesday Book as Chenaresburg, meaning "Cenheard's fortress", in the wapentake of Burghshire, renamed Claro Wapentake in the 12th century. Knaresborough Castle is Norman; around 1100, the town began to grow and provide a market and attract traders to service the castle. The present parish church, St John's, was established around this time. The earliest identified Lord of Knaresborough is around 1115 when Serlo de Burgh held the Honour of Knaresborough from the King. Hugh de Morville was granted the Honour of Knaresborough in 1158. He was constable of Knaresborough and leader of the group of four knights who murdered Archbishop Thomas Becket at Canterbury Cathedral on 29 December 1170. The four knights fled to Knaresborough and hid at the castle. Hugh de Morville forfeited the lands in 1173, not for his implication in the murder of Thomas Becket, but for "complicity in the rebellion of Henry the Young King", according to the Early Yorkshire Charters. The Honour of Knaresborough then passed to the Stuteville family. When the Stuteville line was broken with the death of Robert the 4th (son of Robert 3rd) in 1205, King John effectively took the Honour of Knaresborough for himself. The first Maundy Money was distributed in Knaresborough by King John on 15 April 1210. Knaresborough Forest, which extended far to the south of the town, is reputed to have been one of King John's favourite hunting grounds. Although a market was first mentioned in 1206, the town was not granted a Royal Charter to hold a market until 1310, by Edward II. A market is still held every Wednesday in the market square. In Edward II's reign, the castle was occupied by rebels and the curtain walls were breached by a siege engine. Later, Scots invaders burned much of the town and the parish church. In 1328, as part of the marriage settlement, Queen Philippa was granted "the Castle, Town, Forest and Honour of Knaresborough" by Edward III and the parish church was restored. After her death in 1369, the Honour was granted by Edward to their younger son, John of Gaunt, the Duke of Lancaster and since then the castle has belonged to the Duchy of Lancaster. After the accession of Henry IV the castle lost much of its importance in national affairs, but remained a key site in regional administration for another century. In the Civil War, following the Battle of Marston Moor in 1644, the castle was besieged by Parliamentary forces. The castle eventually fell and in 1646 an order was made by Parliament for its destruction (but not carried out till 1648). The destruction was mainly done by citizens looting the stone. Many town centre buildings are built of castle stone. The railway age began in Knaresborough in 1848 with the opening of a railway station on Hay Park Lane; this was replaced with the current one three years later in 1851. The town had a railway line to Boroughbridge until it closed to passengers in 1950; it was dismantled in 1964. Historically part of the West Riding of Yorkshire, Knaresborough became part of North Yorkshire in 1974. Knaresborough House on the High Street houses Knaresborough Town Council and the Yorkshire Federation of Young Farmers' Clubs. Knaresborough hosts the annual Bed Race, organized by the Knaresborough Lions Club. It is held on the second Saturday of June. The event was first staged in 1966. An annual town centre arts summer festival, FEVA (Festival of Entertainment and Visual Arts), has run since 2001. The town was used in the opening election sequence in the first episode of the ITV comedy series The New Statesman and some exterior shots for the series were filmed around Knaresborough. The Frazer Theatre is just off High Street. Sights in the town include the remains of Knaresborough Castle, the Courthouse Museum in the castle grounds, Mother Shipton's Cave, the House in the Rock, St Robert's Cave (dating from the Middle Ages), and the railway viaduct over the River Nidd. The House in the Rock, also known as Fort Montague, is a local Knaresborough curiosity. In the early 19th century, a strange child appeared in the Hill family. This child had abnormal very blonde woolly hair resembling the fleece of a sheep and was known as the Woolly-Headed Boy of Fort Montague. He conducted visitors around the house and was a great curiosity himself. The Chapel of Our Lady of the Crag on Abbey Road is a Grade I listed shrine dedicated to the Virgin Mary. It was built in 1408 by John the Mason after his son, who was presumed dead in a rockfall in a local quarry, was found alive, with the son's escape having been attributed to the mason's frequent prayers to Mary. Knaresborough is the site of Ye Oldest Chymist Shoppe in England, opened in 1720. The principal areas of public open space are the Knaresborough Castle grounds, Horseshoe Field, the King George V Playing Field and Jacob Smith Park, a 30 acres (12 ha) parkland on the edge of the town, bequeathed to Knaresborough by Miss Winifred Jacob Smith in 2003. Conyngham Hall is close to the town centre. Until the 1980s there was a small zoo in the grounds. Near to the castle are Bebra Gardens, formerly the Moat Gardens, renamed after Knaresborough's twin town in Germany. The Commercial (formerly Borough Bailiff) public house, owned by the Samuel Smith Brewery, is the oldest pub in Knaresborough. The town has a large supermarket Lidl, which is located on the site of a former Co-Op store in Chain Lane, as well as smaller supermarkets in the town centre. The St. James retail park on the outskirts of the town, off Wetherby Road, has a number of retail chain units. The town has 15 public houses, a wine bar, two working men's clubs and several restaurants. There are a number of national retailers with branches in the town centre, mostly around the High Street, Market Place and Castle Courtyard (a shopping arcade in the former town hall). The town also has a small public swimming pool. Knaresborough is served by Knaresborough railway station, on the Harrogate Line between Leeds and York. 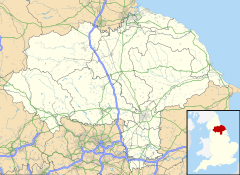 The town is 4 miles (6.4 km) from junction 47 of the A1(M) motorway (Great North Road), and on the A59 which links York and Wallasey. It is further served by Transdev and Connexions who both run buses in the area that centre around Knaresborough bus station on the High Street. The closest airport is Leeds Bradford Airport with bus links from neighbouring Harrogate. Knaresborough is mostly a commuter town however it serves as a local centre for the surrounding rural villages. The town has a small tourism industry and service sector. There is a small industrial estate on Manse Lane in the East of the town. Knaresborough has its own local weekly newspaper; the Knaresborough Post, although it borrows content heavily from neighbouring publications. The town has two Church of England churches, one Roman Catholic and one Methodist. It also has one United Reformed and one Mormon. Knaresborough has five primary schools and one secondary school; King James' School. There is a further education college in nearby Harrogate and universities in Leeds and York. The town has a two-storey library on the Market Place. Knaresborough Town F.C. is based at Manse Lane; they play in the Northern Counties Eastern League Division 1. Youth football is catered for by Knaresborough Celtic with junior teams from Under 6s to Under 17s. Scotton Scorchers offer youth football for boys from the under 6s to under 12s and girls to under 17's. Knaresborough Town are also developing youth football. Knaresborough Rugby Club play in the Yorkshire Leagues. The club was formed in 1982 and play at their Hay-a-park ground which opened in 2014. Unusually for a Yorkshire town, there is no rugby league club, the closest being in Wetherby. The town has two cricket clubs. Knaresborough Forest Cricket Club were Nidderdale League Division 3 winners in 2005, afterwards promoted from Division 2 as runners-up in the following season. Knaresborough Cricket Club have a ground on Aspin Lane, where adult teams play in the Airedale & Wharfedale Senior Cricket League and junior teams play in the Nidderdale Junior Cricket League. St Robert, a 12th-century hermit whose cave can be found near the River Nidd. Ursula Southeil (c. 1488–1561), known as Mother Shipton, was a medieval seer said to have been born in a cave south of the town. John Metcalf, known as "Blind Jack", lost his sight in childhood and was a violin player, local guide, bridgebuilder and roadmaker. A public house in the market square bears his name. Robert Aagaard, a Knaresborough manufacturer, founded the youth movement Cathedral Camps. Eugene Aram, the 18th century scholar and murderer lived here. Squadron Leader James Harry "Ginger" Lacey DFM & Bar, Second World War RAF fighter pilot, attended school in Knaresborough. Lacey was from Wetherby but his academic achievements enabled him to attend school in Knaresborough rather than Wetherby. Charles Farrar Forster, the first vicar of Beckwithshaw Church, was born here in 1848. Gorden Kaye (1941–2017), actor and singer, best known for playing René Artois in the British comedy series 'Allo 'Allo!. Grant Kirkhope, musician and composer best known for his work with Rareware, raised here and attended King James's School. ^ UK Census (2011). "Local Area Report – Knaresborough Parish (1170217036)". Nomis. Office for National Statistics. Retrieved 6 February 2019. ^ Victor Watts (ed. ), The Cambridge Dictionary of English Place-Names Based on the Collections of the English Place-Name Society (Cambridge: Cambridge University Press, 2004), s.v. Knaresborough. ^ "A Brief History" (PDF). Harrogate council. 2004. Archived from the original (PDF) on 27 September 2007. Retrieved 24 July 2007. ^ "Knaresborough Castle". Knaresborough online. 2005. Archived from the original on 27 September 2007. Retrieved 24 July 2007. ^ Kellett, Arnold (1991). Historic Knaresborough. ISBN 978-1-870071-66-6. ^ Kellett, Arnold. Knaresborough (2003) The History Press Ltd. ISBN 0-7524-3017-3. ^ "Yorkshire Federation of Young Farmers Clubs". Retrieved 13 January 2013. ^ "The Great Knaresborough Bed Race". www.bedrace.co.uk. Retrieved 19 April 2016. ^ "Home - Art, Music, Drama, Dance, Poetry, Flavours - FEVA Knaresborough". Art, Music, Drama, Dance, Poetry, Flavours - FEVA Knaresborough. ^ "Harrogate and District In Film and Television : Pt1 - Visit Harrogate". www.visitharrogate.co.uk. Retrieved 16 September 2017. ^ "The House in The Rock". knaresborough.co.uk/history. Retrieved 25 September 2017. ^ Historic England. "CHAPEL OF OUR LADY OF THE CRAG (Grade I) (1149913)". National Heritage List for England. Retrieved 23 September 2018. ^ "Chapel of Our Lady of the Crag". Retrieved 18 January 2018. ^ "Blue plaque marks oldest chemist's shop..." The Yorkshire Post. ^ "Park is left for public to enjoy". Rippon Gazette. 24 December 2003. Retrieved 13 January 2013. ^ "The Commercial (formerly Borough Bailiff)". whatpub.com. Retrieved 25 September 2017. ^ "Lidl to open larger replacement store in Knaresborough". Harrogate Advertiser. 8 January 2016. Retrieved 6 February 2019. ^ Chalmers, Graham (17 May 2018). "Water leaks close Harrogate council-owned swimming pool". Harrogate Advertiser. Retrieved 6 February 2019. ^ "'Allo 'Allo! star Gorden Kaye dies at 75". BBC News. 23 January 2017. Retrieved 23 January 2017.